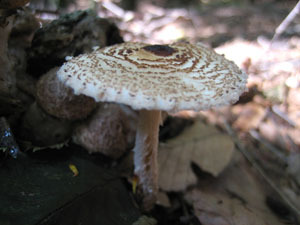 White cap with brown scales, free gills, and evanescent ring on shaggy stalk. Cap: 2.5-7.5 cm (1-3") wide. Bell-shaped, becoming convex to flat with brown central knob. Margin sometimes upturned with age. Fibrous to scaly. Brown to yellow towards margin. 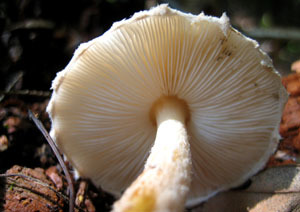 Gills: Free, close, narrow and white. Stalk: 5-10 cm (2-4") long and 3-5 mm (1/8-1/4") thick. Silky, pale and hollow above ring. 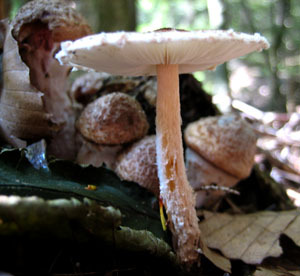 Veils: Partial veil fibrous, white. May disappear with age. 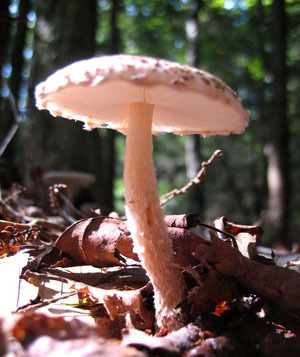 On ground in coniferous, oak and mixed woods. Throughout North America.